This year is a very special year for a friend and colleague of mine, Wildman Steve Brill. 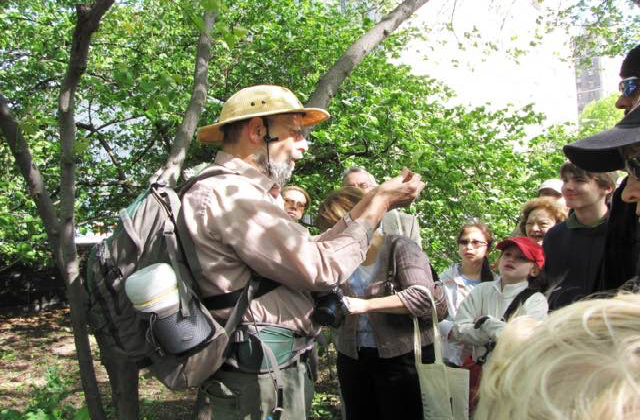 Steve’s official start to his 35th season of foraging tours is this weekend, March 4 in New York’s Central Park, and March 5 in Prospect Park. There is not a doubt that Steve has earned a great deal of respect in the foraging community after spending over three decades dedicated to teaching people how to forage. A naturalist and author, Steve has been leading foraging tours throughout the Greater New York area since 1982. In early 1986, Steve became a common name in many communities across the state and the country when two undercover parks officials took photos of various plants he was picking to show people. He was arrested, handcuffed and booked for criminal mischief; he ate a dandelion. It seems hard to believe that this is possible but it happened. The irony is that with all the publicity this caused, the NYC Parks Department negotiated with Steve; charges were dropped and he was hired to teach foraging, which he did for four years before returning to freelance work. Over the years Steve has enjoyed the fruits of foraging and now his 12-year old daughter, Violet, co-leads on his edible plant walks. Violet has a very keen eye for spotting plants and fungi and loves working with her dad. She is enthusiastic, energetic and a huge asset in helping Steve to teach children about foraging (and she steals Steve’s best jokes too)! Steve has written several books but perhaps one of the most highly sought-after books is very popular with vegans and vegetarians. Wild Vegan Cookbook (Harvard Common Press, April, 2002) has helped to change the way people think of preparing gourmet food. One doesn’t have to be vegan or vegetarian to enjoy the incredible recipes. This is truly an amazing recipe book that will transform how you view (and taste)“weeds”. Steve doesn’t just teach what is edible. He teaches adults and kids about the many common, overlooked, renewable wild edible and medicinal plants and mushrooms that people often destroy because they have the belief they are “just weeds”. Steve firmly believes that by studying foraging and participating in nature in a non-destructive manner, we can increase our enjoyment of nature, grow healthier, and reaffirm our commitment to preserving and rebuilding our ecological riches. It’s especially important for kids to have these experiences as well because these are the foods and medicines that the human race once relied on to survive.